Members of Boy Scout Troop 33 prepare bacon-related food items during BaconPalooza on Saturday in Van Buer Plaza. Bacon Palooza returned to DeKalb after a one-year hiatus. 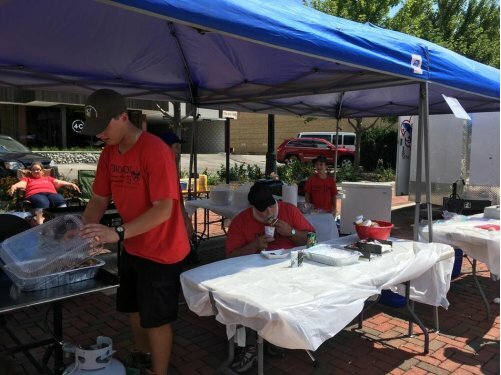 Bacon-wrapped pineapple and cherry-bacon flavored shaved ice were a couple of the hot items during the annual bacon celebration that marked the end of Kishwaukee Fest on Saturday in Van Buer Plaza. All food vendors in the festival were required to have one bacon item on their menus, and all festival-goers were required to come with an open mind. Embrey said he included a bacon-oriented event in Kishwaukee Fest to bring something unique to DeKalb County, which is a large producer of pork. “Chicago has pizza and hot dogs, but what does DeKalb taste like?” Embrey said. Kishwaukee Fest was canceled last year because Embrey was not available to oversee it, but the annual week-long celebration will continue. Bacon will still be a mainstay of the festival next year, as Embrey said he does not foresee the craze going away.